Agriculture robots are used to increase productivity while lowering overall costs, the agriculture industry has been actively working to adopt different forms of robotic technology, The farmers can use the tractors & harvesters & they are self-guided by GPS, Robots can automate operations like pruning, thinning, mowing, spraying, and weed removal, Sensor technology is used to manage the pests and diseases that affect crops. It is the robot that is used in agricultural purposes, there are applications of robots or drones in agriculture include weed control, cloud seeding, planting seeds, harvesting, environmental monitoring & soil analysis, Agriculture Field robots can automate tough manual tasks, they’re used on land and operate fully autonomous. Many different types of field robots are used in agriculture, They are diverse in their form & function, The robots are stepping up and helping farmers to improve efficiency and bring in larger crop yields, Agricultural robots can automate slow, repetitive, and dull tasks for the farmers, allowing them to focus more on improving overall production yields. 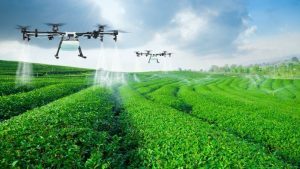 Agricultural robots and drones are changing agriculture, Robots are used in automated farming, from cobot-assisted milking to cow-herding drones, Modern agriculture suffers from many problems, Farmers in developed countries are suffering from a lack of workforce, Automated farming is an attempt to solve these problems by using robotics and advanced sensing. The robots can be used on farms and they enable precision agriculture techniques, they are used to autonomously monitor soil respiration, photosynthetic activity, leaf area indexes (LAI) and other biological factors, The robots are used to herd livestock on large ranches, They monitor the animals and ensure they are healthy and have enough area to graze. The robots are equipped to monitor the pollution created by agriculture at the ground level, They can measure carbon dioxide & nitrous oxide emissions, so, the farmers can reduce their environmental footprint, Crop Harvesting robots can work around the clock for faster harvesting, in some cases completing the same amount of work as approximately 30 workers. Robots offer an efficient method in spraying pesticides, Micro-spraying robots can autonomously navigate the farm and deliver targeted sprays of herbicides to eliminate weeds, This approach reduces crops’ exposure to herbicides and helps prevent the growth of herbicide-resistant weeds. Fruit Harvesting robots are used to harvest fruit in addition to crops, Fruit harvesting is notoriously difficult for robots, These robots are equipped with the advanced vision systems to identify fruits and they can grasp them without damaging them, The robots with 3D vision systems can accurately plant & seed crops for optimal growth. Nursery Automation robots can create major efficiencies for crop nurseries, primarily to move plants around large greenhouses, they help address a growing labor shortage, Nursery automation is where seeds are grown into young plants, which are later planted outside, Nursery plants are sold direct to consumers and landscape gardeners. The robots can be attachments to a tractor, As humans drive the tractors, the robots are designed to adapt to the speed that the human is driving, However, fully-autonomous tractors are also becoming popular, However most agricultural robots are applied in crop growing, there have been a few emerging applications within sheep & cattle farming, Collaborative robots are used to help in milking process on dairy farms, The UR5 can be used to spray disinfectant on the cow’s udders in preparation for milking. Robots are used in crop seeding, Autonomous precision seeding combines robotics with geomapping, The map is generated which shows the soil properties (quality, density, etc) at every point in the field, The tractor, with robotic seeding attachment, places the seeds at precise locations & depths so that each has the best chance of growing. Robots are used in crop monitoring and analysis, New sensor and geomapping technologies enable the farmers to get a much higher level of data about their crops than they have in the past, Ground robots & drones provide a way to collect this data autonomously. The farmer can move the drone to the field, and initiate the software via a tablet or smartphone, and view the collected crop data in real time, Ground-based robots provide more detailed monitoring as they can get closer to the crops, Some can be used for other tasks like weeding and fertilizing. Robot-Assisted Precision Irrigation can reduce wasted water by targeting specific plants, Ground robots autonomously navigate between rows of crop and pour water directly at the base of each plant, Robots are used in picking & harvesting crops, It can be done with a combine harvester, which can be automated just like a tractor. Robots can access areas where other machines can’t, Robots present a higher quality of fresh products, lower production costs, and a decreased need for manual labor, They can be used to automate manual tasks, Thinning robot uses computer vision to detect plants as it drives over them and decides which plants to keep and which to remove, Thinning reduces the density of plants so that each has a better chance of growing, Pruning involves cutting back parts of plants to improve their growth. Weeding robots are used in weeding the plants, They use computer vision to detect the plants as it is pushed by the tractor, It automatically hoes the spaces between the plants to uproot the weeds, Other weeding robots use lasers to kill the weeds and they don’t need to use chemicals. Farmers can use fruit picking robots, driverless tractor/sprayers, and sheep shearing robots, They are designed to replace human labor, Robots can be used in pruning, weeding, spraying and monitoring, They can be used in livestock applications (livestock robotics) such as automatic milking, washing and castrating.